Taj Medical Complex is one of the famous and recognized general hospitals of Karachi that offers some of the best healthcare services on economical rates to the Karachiites. Centrally located, Taj Medical Complex targets the patients from nearby localities. 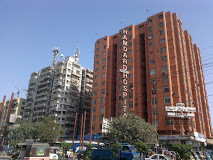 The page is based on the basic information about the famous hospital of Karachi, Taj Medical Complex. You can find some of the renowned doctors from specialized fields Skin Specialization, Orthopedics, Cosmetic and Plastic Surgery, General Surgery on this page. You can access the contact details of Taj Medical Complex along with its relevant information of the professional doctors and surgeons on HamariWeb.com. You can get hold of the contact details and consultation timings of doctors in Taj Medical Complex from HamariWeb. what is timing for Mr. Shahid? could any one can tell me is he ENT surgeon? Go to the 5th floor and see the filth. Doctors pay a monthly maintenance charge every month for cleaning their respective floors and that goes into the pockets of the corrupt management. I think you need to update your website and doctors. Please let me know the best Orthopedic Doctor in Taj Comlex or another Hospital if any one have good advice so please tell me it's urgent. Please let me know any Experienced pediatric surgeon in Taj medical complex.